Women’s suffrage advocate Millicent Garrett Fawcett will become the first woman to be honoured with a statue in Westminster’s Parliament Square next month to mark the 100th anniversary of the passing of the 1918 act which gave women the vote for the first time. But who exactly was she? Born in Aldeburgh, Suffolk, on 11th June, 1847, Millicent Garrett was the daughter of Newson Garrett, a merchant and shipowner, and his wife Louisa – the eighth of their 10 children. At the age of 12, in 1858, she went to London with her older sister Elizabeth (who would go on to become Britain’s first female doctor) to study at a private boarding school in Blackheath. A key moment came seven years later in 1865 when she went to hear a speech by radical MP John Stuart Mills who spoke of equal rights for women. Fawcett was deeply impacted and became actively involved in his campaign. 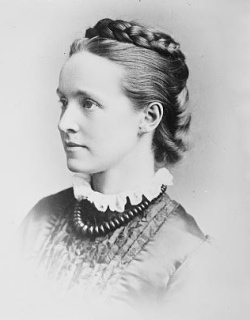 When she was just 18, Millicent was introduced via Mills to Henry Fawcett, MP for Brighton and women’s rights activist and the two became close friends before, despite an age difference of 14 years, marrying on 23rd April, 1867. As well as caring for her husband who had been blinded in a shooting accident some 10 years before they were wed, Millicent took up a role as his secretary. In 1868, Millicent gave birth to their only child, Philippa, and the family spent their time between two households – one in London (at 51 The Lawn on the site of what is now Vauxhall Park) and the other in Cambridge (where she later became a co-founder of Newnham College). Meanwhile, with her husband’s encouragement, she was also pursuing her own writing career, penning the popular short book, Political Economy for Beginners, which was published in 1870, as well as becoming a well-known public speaker on a range of issues including women’s rights. 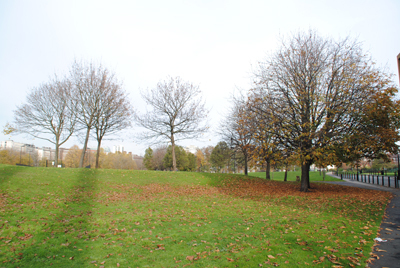 While when her husband – then Postmaster General – died of pleurisy on 6th November, 1884, Millicent temporarily withdrew from public life (it was after Henry’s death that, as per his wishes, Vauxhall Park was created on the site of his former home). But the years following saw her become increasingly engaged in activities in support of women’s suffrage. She was involved in the formation of the National Union of Women’s Suffrage Societies (NUWSS) in 1897 – it went on to become the largest group of its kind with 50,000 members by 1913 – and would later become its president, a post she would hold until after World War I.
Fawcett’s interests, however, also saw her involved in campaigns to curb child abuse, to end child marriage and the “white slave trade” as well as the formation of a relief fund for South African women and children affected by the Boer War (in 1901 she visited South Africa as head of a commission charged with reporting on conditions in concentration camps). When some groups advocating for women’s suffrage started to take more violent action – which included breaking windows and hunger strikes when jailed, Fawcett argued against such militancy and remained among the moderates, convinced that women would eventually win the vote as a result of the changes taking place in society. Suffrage activism was interrupted thanks to World War I but the role women played in support of the war effort saw opinion shift enough for, in 1918, the passing of the Representation of the People Act, which gave women aged over 30 voting rights. In 1919, Fawcett retired from active engagement in politics. She was appointed a Dame Grand Cross of the Order of the British Empire in 1925. 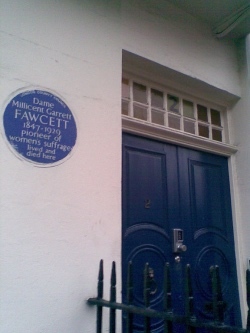 Fawcett witnessed the passing of an act to give women equal voting rights to men in 1928 – 10 years after the first act – before dying, at the age of 82, at her home at 2 Gower Street in Bloomsbury, London, on 5th August, 1929 (there’s a Blue Plaque on the property where she had lived for more than 45 years – pictured above). She was cremated at Golders Green but there is a memorial to both her and her husband in Westminster Abbey. The Fawcett Society, which has carried her name since 1953, continues to fight sexism and gender inequality in the UK, campaigning on issues such as closing the gender pay gap. 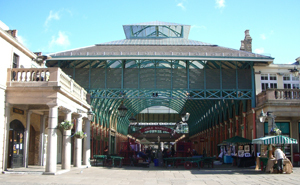 Of course, James Bond has a long-standing relationship with London and there’s a long list of locations that have featured in the many Bond films over the years. 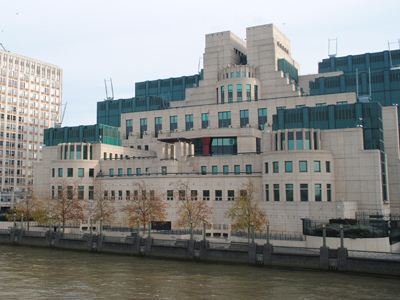 But today we’re looking at just one – the Thames-side HQ of spy agency MI6. 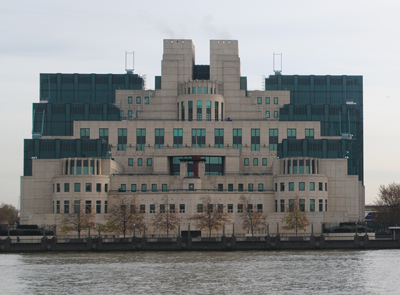 The actual London home of the organisation (also known as the Secret Intelligence Service), the not-so-secret building – which is also called the Vauxhall Cross building – is located on Albert Embankment in Vauxhall, sitting alongside Vauxhall Bridge. It has made numerous appearances in the past few James Bond films – from its first appearance in Golden Eye to its being attacked in The World Is Not Enough, blown up in Skyfall and the featuring of its ruinous remains in the latest film, Spectre. The subject of some criticism when it was unveiled (and much loved by others), the fortress-like building was designed by architect Terry Farrell. It was built in the early 1990s and officially opened by Queen Elizabeth II in 1994. It suffered – and survived – a real-life rocket attack in 2000. Other locations to have featured in recent Bond films in London, meanwhile, include Somerset House (passed off as St Petersburg in Golden Eye), the National Gallery (Bond, played by Daniel Craig, first encounters the new Q, played by Ben Wishaw, in Room 34 in Skyfall), and the rooftops of Whitehall (also Skyfall). And that’s just for starters. 1. The origins of the Lord Mayor’s Show go back to 1215 when King John granted the city the right to elect their mayors but only on condition that they made their way to Westminster to swear their loyalty each year. There is evidence that by the late 14th century, the journey had turned into something of a procession. 2. Lawyer Fiona Woolf is the 686th Lord Mayor, formally taking on the job when outgoing mayor Roger Gifford hands the City insignia to her in what is known as the Silent Ceremony held at Guildhall today. She is only the second woman to ever hold the post; Mary Donaldson was the first to do so in 1983. 3. The person responsible for organising the day is the Pageantmaster. The current Pageantmaster is Dominic Reid – he gets to travel in a ceremonial Landrover. 4. The day was originally held on 28th October, the Feast of St Simon and St Jude, but was moved to 9th November in 1751 when Britain adopted the Gregorian Calendar. Because this meant it call be held on any day of the week, to simplify matters in 1959 it was decided that the Show would be held on the second Saturday in November. 5. Effigies of Gog and Magog, seen guardians of the City of London, have appeared in the Lord Mayor’s Show since at least 1554, during the reign of King Henry V. For more on Gog and Magog, see our Famous Londoners post. 6. Since the early 15th century the Lord Mayor had travelled to Westminster via a pageant on the River Thames. This was dropped in favour of travelling on horseback. 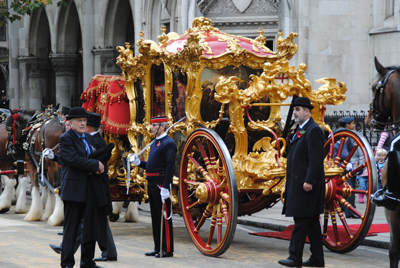 The magnificent State Coach used in tomorrow’s procession, meanwhile, was first used to convey the Lord Mayor to Westminster in 1757 (the mayors had ridden in coaches since 1712 after Sir Gilbert Heathcote fell off his horse in 1711). For more on the State Coach, see our Treasures of London article. As happened last year, before the Show starts, the Lord Mayor will once again travel upriver in the QRB Gloriana accompanied by a procession of 24 traditional Thames boats from London’s livery companies and port authorities. The flotilla will leave Vauxhall at 8.30am and travel past Tower Bridge to HMS President. 7. The modern route of the show – which takes in Cheapside, Ludgate Hill, Fleet Street going out from Mansion House to the Royal Courts of Justice and then returns back along Queen Victoria Street – was fixed in 1952 (although occasionally it has been disrupted due to things like roadworks). It apparently features 3,500 manholes, all of which have to be checked before the big day. 8. The modern Lord Mayor’s Show parade, which kicks off at 11am, is three-and-a-half miles long. This year’s procession features more than 7,000 participants. 9. Among those in the parade are representatives of the livery companies including that of the “great 12” – the Mercers, Grocers, Drapers, Fishmongers, Goldsmiths, Merchant Taylors, Skinners, Haberdashers, Salters, Ironmongers, Vintners and Clothworkers – as well as other companies including some distinctly “new world”. 10. The fireworks display was canceled last year but is back for this year’s festivities. It kicks off at 5pm. 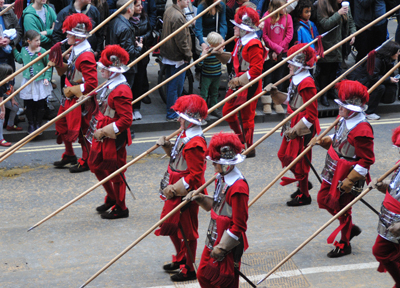 For more on the show – including a downloadable timetable and map – head to www.lordmayorsshow.org. We’ve already mentioned these two riverside embankments as part of our previous piece on Sir Joseph Bazalgette’s revolutionary sewer system. But so important are they to the shape of central London today – not to mention a great place to take a stroll – that we thought they’re also worth a mention in their own right. 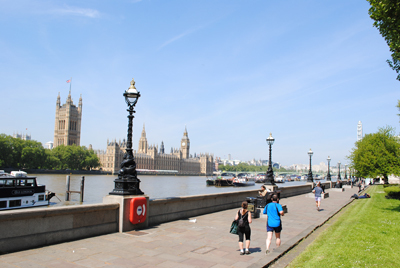 As mentioned, the Victoria and Albert Embankments (the latter is pictured right) – named, of course, for Queen Victoria and her by then late consort, Prince Albert, who had died in 1861 (see our previous post What’s in a name?…Victoria Embankment) – were located on opposite sides of the River Thames and involved reclaiming a considerable amount of the river so new sewers could be laid. Construction of Victoria Embankment – which was also seen as a way to relieve traffic congestion in the central London area – started in the mid 1860s and was complete by 1870. Running along the north and western banks of the Thames between Westminster and Blackfriars bridges, its creation involved the demolition of many riverside buildings as a new walk and roadway were constructed behind a wall. Numerous monuments have since been located along this promenade – they include the Battle of Britain Monument, RAF Memorial and the mis-named Cleopatra’s Needle (see our earlier post to find out why) – as well as a number of permanently berthed ships including the HQS Wellington – the base of the Honorable Company of Master Mariners – and the HMS President. The walkway also features original decorative lamps – interestingly, Victoria Embankment was the first roadway in London to be permanently lit by electric-powered lighting (from 1878). The parks, collectively known as Victoria Embankment Gardens, contain numerous statues and monuments (including one to Bazalgette himself – it’s located close to the intersection with Northumberland Avenue) as well as a bandstand. They also contain the remains of York Watergate – once fronting on to the river, it shows how much land was reclaimed for the project (you can also visit the riverside entrance to Somerset House to gain a feel for where the river once was – look through the glass floor and you’ll see the old riverbank below). Albert Embankment, meanwhile, runs between Vauxhall and Westminster Bridges on the eastern side of the river. Constructed around the same time as Victoria Embankment, it was designed to prevent flooding of the low-lying areas of Vauxhall and Kennington and to help in Bazalgette’s sewage system plan (although it apparently doesn’t have the same large sewers as can be found on the other side of the river). Sadly, the demolition did see the centre of what was once the village of Lambeth removed to make way for the new promenade and roadway. But like Victoria Embankment, Albert Embankment features delightfully decorative lamps along the riverfront promenade and is a great place for a walk in any weather. • The Lord Mayor’s Show – the largest unrehearsed procession in the world – will be held on 10th November. This year’s procession – celebrating the election of the 685th Lord Mayor of London, Alderman Roger Gifford – will feature more than 6,500 people winding their way through the City of London in a three-and-a-half mile-long display including 22 marching bands, 125 horses, 18 vintage cars, 21 carriages, an original American stagecoach, a Sherman tank, a steamroller and a Japanese Taiko drum band. While there will be no fireworks after this year’s parade, following the success of last year’s trial there will be an early morning flotilla with the Lord Mayor conveyed in the barge QRB Gloriana from Vauxhall up the Thames to HMS President, just below St Katharine Docks, from where he will make his way to the Mansion House to join the procession as it heads first to St Paul’s and then on to the Royal Courts of Justice before returning (via a different route). There are no grand stand seats left but plenty of places you can watch it for free (for a chance to win free Grandstand tickets, head to the Lord Mayor’s Show Facebook page and ‘like’ it). We’ll be talking about this more next week, but in the meantime, for maps and details of a new smart phone app, head to www.lordmayorsshow.org. • Two prehistoric Japanese pots have gone on display at the British Museum. Loaned from the Nagaoka Municipal Science Museum, the pots date from the Middle Jomon period (3,500-2,500 BCE) and consist of a ‘flame’ and a ‘crown’ pot which were excavated in Nagaoka city. The pots form part of the Asahi Shimbun Displays in room 3 and will be there until 20th January. Meanwhile, continuing the Asian theme, an exhibition of more than 100 contemporary carved Chinese seals by artist Li Lanqing is on display in room 33 until 15th January. Admission to both is free. For more, see www.britishmuseum.org. • On Now: Seduced by Art: Photography Past and Present. The National Gallery’s first major exhibition of photography, the display looks at the relationship between historical paintings and photography, both its early days in the mid-19th century and the work of contemporary photographers – in particular how photographers have used the traditions of fine art to “explore and justify” their own works. Almost 90 photographs are displayed alongside a select group of paintings for the show. Admission is free. 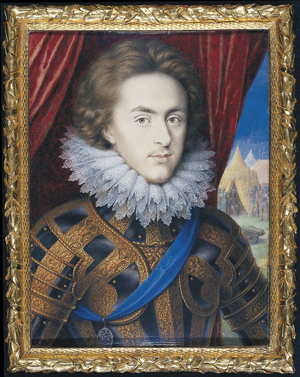 Runs until 20th January in the Sainsbury Wing. For more, see www.nationalgallery.org.uk. Where’s London’s oldest…Thames foreshore structure? The oldest structure on the Thames foreshore is only a relatively recent discovery. It was in the spring of 2010 that archaeologists found six timber piles driven into the foreshore just in front of the spy agency MI6’s building in Vauxhall (pictured below with the river covering the site). The piles – no specific function for which has yet been identified – were up to 0.3 metres in diameter and were found to be more than 6,000 years old. That date puts them in the Mesolithic period when the level of the river was lower – meaning the structure was probably built on dry land – and the landscape considerably different to what it is today. Radiocarbon dating suggests the trees for the structure were felled between 4790 BC and 4490 BC. The site, which is at the confluence of the Thames and now largely underground River Effra, was initially kept secret while surveying was carried out. Nearby were found stone tools dating from a similar era to the piles – they included a tranchet adze for woodworking – and pottery fragments from the slightly later Neolithic era. The discovery near the low tide line was made by archaeologists from the Thames Discovery Programme and the site then surveyed with the assistance of English Heritage and the Museum of London as well as the geomatics teams from Museum of London Archaeology. The site is 600 metres downstream from a Bronze Age timber jetty (about 1,500 BC) found in the 1990s. The latest in the series in which we ask you to identify where in London this picture was taken and what it’s of. If you think you can identify this picture, leave a comment below. We’ll reveal the answer early next week. Good luck! 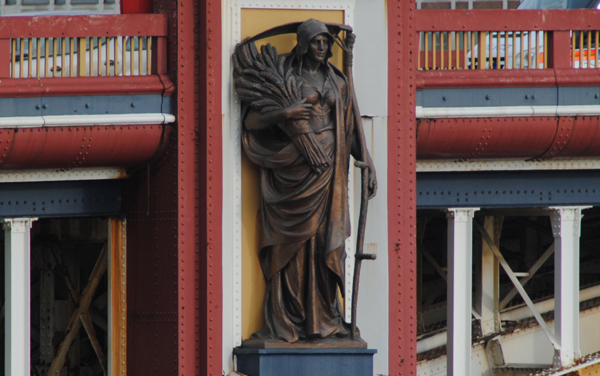 Well done to Janet Holmes – this is indeed a detail from Vauxhall Bridge. 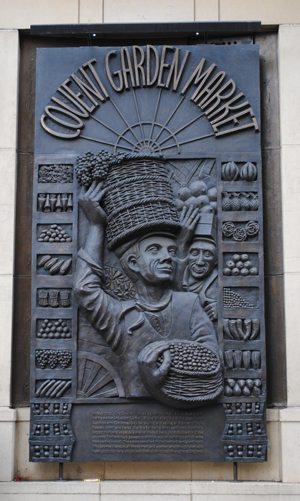 The picture shows Agriculture, one of many statues which adorn the bridge above the piers (this work is on the upstream side). The statue is the work of Frederick W Pomeroy – Alfred Drury was also commissioned to create female bronze sculptures. It was installed in 1907, a year after the current bridge, a Grade II* listed steel and granite structure, was opened for traffic. Other sculptures by Pomeroy on the upstream side include Architecture, Engineering and Pottery while the downstream side is adorned with works by Drury – Science, Fine Arts, Local Government and Education. The 1906 bridge replaced an earlier bridge built between 1809-16, which was originally named Regent Bridge and later renamed Vauxhall Bridge. It was the first iron bridge over the Thames as well as the first to carry trams and was built on the site of an earlier ferry crossing. 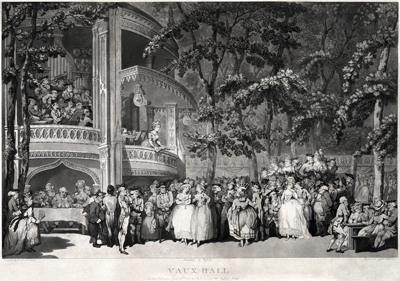 First laid out in the mid 17th century, Vauxhall Pleasure Gardens, on the east bank of the Thames just south of Lambeth, rose in fame to become one of London’s leading public entertainment venues. T he gardens, initially known as New Spring Gardens, are believed to have opened around the time of the Restoration of 1660 on a site which had been formerly an estate owned by vintners John and Jane Vaux (Jane was apparently widowed). Initially apparently no more than an ale-house with a garden attached, the gardens grew to span several acres and featured a central hub and long avenues for strolling. Admission was initially free with money made from food and drink sold there. Among the earliest recorded visitors to the gardens was John Evelyn in 1661, describing it as a “pretty contrived plantation” and diarist Samuel Pepys, who wrote of a visit he made on 29th May, 1662 (he is known to have returned numerous times). From 1729, the gardens came under ownership and management of John Tyers, entrepreneur, property developer and patron of the arts, and it was he who, until his death in 1767, oversaw the transformation of the area into an arts hotspot which included sculpture (in particular a fine statue of the composer Handel), music, painting and architecture. Thanks partly due to the patronage of Frederick, Prince of Wales, the gardens become the fashionable place to be seen. The variety of entertainment on offer at the gardens – the name of which was only officially changed to Vauxhall Gardens in 1785 – grew substantially over the years: from concerts and fireworks displays to performances by tight rope walkers and lion tamers and even re-enactments of famous battles. The gardens became renowned as site for balloon ascents and, for its architecture – the number of buildings there grew over the years to include a rococo ‘Turkish tent’, Chinese pavilion, and, another rococo building, the Rotunda (where concerts could be held in wet weather). There was also a cascade and private ‘supper boxes’ for those who could afford them; those who couldn’t could dine at tables set under the trees. From the outset, Vauxhall was known as a place where the sexes could mix freely and, therefore, for romantic assignations – in fact, one area of the gardens became known as the ‘Dark Walk’ for the fact it was, unlike other areas of the gardens, never illuminated by lamps and it was in this area, frequented by prostitutes, that many of the more illicit liaisons took place. By the late 1700s and early 1800s, the gardens, one of a number of pleasure gardens in London, had reached the height of their popularity with reportedly more than 60,000 people said to have attending a fancy dress party held one night in the late 1700s. Those who attended events in the gardens included royalty as well as the likes of Samuel Johnson and James Boswell (see Thomas Rowlandson’s image above, Vauxhall Gardens, showing the likes of Johnson and Boswell, along with Georgina, Duchess of Devonshire, and the future King George IV, at the gardens in about 1779) as well as, much later, Charles Dickens (by the time Dickens visited, however, the heyday of the gardens was already well over). The gardens closed in 1859 due apparently to declining popularity and were eventually replaced with housing. After being badly bombed in World War II, however, the site once again returned to being a garden, known as Spring Gardens. The gardens (pictured) still occupy the site not far from Vauxhall tube station – part of them is used by the Vauxhall City Farm as paddocks for horses and livestock and they also contain a multi-use games court. For an authoritative and comprehensive work on the Vauxhall Gardens, try David Coke and Dr Alan Borg’s Vauxhall Gardens: A History. There’s also much more information on David Coke’s website here. There’s also a detailed history here. David Coke is curating an exhibition at The Foundling Museum, The Triumph of Pleasure, which looks at the way in which the gardens and the establishment of the Foundling Hospital in 1739 “changed the face of British art forever”. Runs from 11th May to 9th September. For more, see www.foundlingmuseum.org.uk.